When the light is just so. When it lands in just the right place. At just the right time. And, illuminates something, like it was lit from the inside out. It was one of those moments. On the way to dinner with my cherished and long-time friend, whom I’ve known since grade school. On a busy street – pedestrians picking up a few things on the way home, traffic everywhere. And, the early evening light is splashing across everything. Across the building facades, and the parked cars, and the store front windows – at that great, late-afternoon angle. I’m keeping my eyes open for a shot. Something from the world around me that draws my attention. A detail. A shape. Some bit of beauty. But, there’s so much to see that I can’t actually see anything. It’s chaotic. Clashing colours and competing signs. The meat market, next to the shoe store, next to the coffee shop, next to the dollar store. Cheek by jowl. Add to that the moving traffic, and darting cyclists and rushing pedestrians. It’s sensory overload. But, there’s that sun light! Splashing. And, in spite of the chaos, there’s something fresh and alive, and time seems to be slowing down. 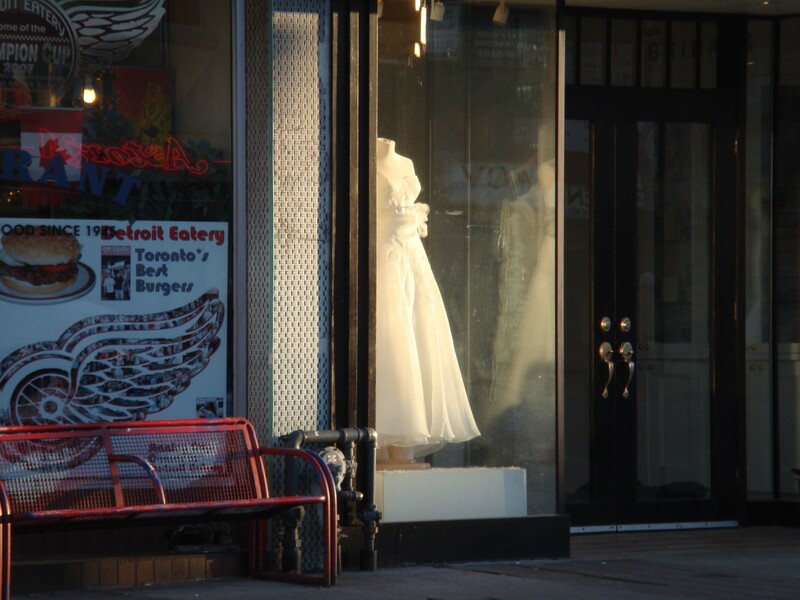 At the stop light, and over to my left, I see the wedding dress. In the storefront. Next to the diner. All lit up by the sun. Now, if I were getting married, I might even think it was a sign – seeing the sun shine its spot light on that gorgeous gown as though it were the perfect dress made just for me. But, maybe, it’s a sign about noticing, and with it a chance to marvel at the light, and the unexpected beauty of a typical street scene on a Monday night early in springtime. This is another in the series, ‘drive-by photography’, where I snap a photograph while waiting for the light to change. Juli – you continue to amaze with your drive-by shots – catching those tiny moments that are so much bigger than that. And within just a few seconds – looking, seeing, capturing. Being ready for that perfect combination of subject and light. This does seem like a “sign” – a gift from the gods of light to she who is ready to receive. You have also captured so well the feeling I get when presented with a new situation – that overwhelming chaos of too much sensory input. I have felt that each time we have traveled since starting on this photographic journey. Simply overwhelmed with too much newness – I find it so difficult to slow down and breathe and see. I have two trips coming up (Houston and NYC) – I am hoping I can conquer that paralysis and somehow capture something grand. Juli, this is truly so beautiful. You captured the light at the perfect time. Sending you wishes for a wonderful day! I read this way early this morning after the kids left for school, and couldn’t take my eyes off that magical light enveloping the dress. This is just beautiful, Juli! Juli … I love your blog – evocative photographs and picture-perfect writing! The drive-by theme is brilliant.I hope to see at least some of this work on Flickr soon. Thanks for coming by! Will be posting to flickr for sure. See you there! This speaks to such beautiful yearning..and memory..and all else. What exquisitely beautiful light. Great eye! What a great post to read reason my bus ride home. Makes me wonder what I might be missing when I’ve got my nose stuck in a book … or browser window on my phone. Hmm…. Lovely! Capturing the ‘unexpected beauty’ in the chaos … photography sure has a way of bringing us into the moment doesn’t it.